The annual horseshoe hunt takes place every year preceding Dan Patch Days. A horseshoe is hidden somewhere within the city of Savage, on public property. Clues are available on the Dan Patch Historical Society's website, in the Savage Pacer and at the Savage Library. The annual horseshoe hunt has taken place since 1996 and has always been sponsored by the Dan Patch Historical Society. Rules Clues are given out each week that lead to the location of a special horseshoe hidden somewhere on "public property" within the City of Savage boundaries. Whoever finds the horseshoe and has a 2019 Dan Patch Days button wins $100. The lucky winner also gets to keep the commemorative horseshoe. 2019 Dan Patch Days buttons are available at Savage City Hall and the Savage Library. 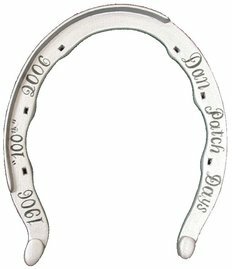 Each Friday, clues for the horseshoe hunt will be available here by 9 p.m. on this web site (www.danpatch.com). This is the only place the clues will be available online. Clues will also be published in the Saturday print edition of the Savage Pacer newspaper. To maintain the interest and integrity of the horseshoe hunt, the following members, spouses and minor children are NOT eligible to participate in the hunt: Dan Patch Historical Society board members, Dan Patch Days Inc. committee members and Savage Pacer newspaper employees. Also, there will not be any back-to-back winners. **Anyone who believes they've found Dan's shoe, please CONTACT US (and Please leave a contact number, we will follow up ASAP.